When you arrive to Culebra, either by ferry or by plane, Dewey is the Island's main port of entry. 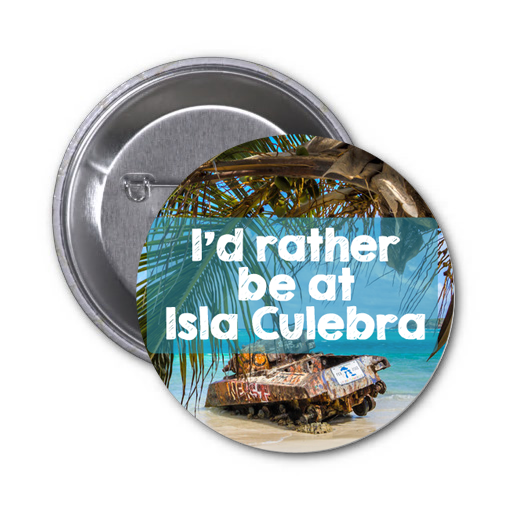 The small town will be the first place you see and it will be where you will most likely get most of your provisions while on Culebra. 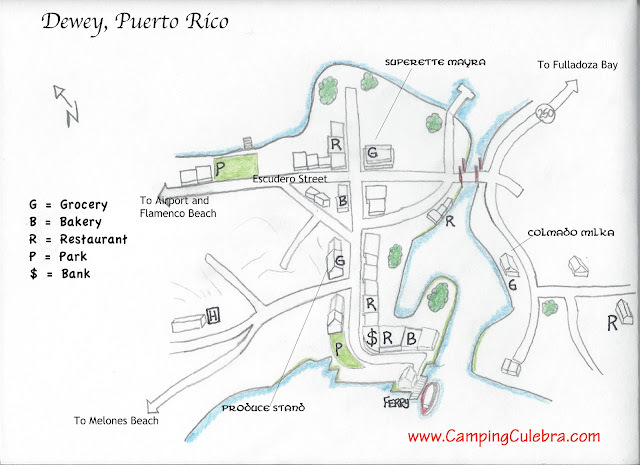 With this in mind, it is good for the camper or visitor to Culebra to get to know the town right away. Dewey is a very small and easily walkable town that has a good variety of shops and restaurants for the traveler. There are a couple of bakeries, a few grocery stores, and a host of other stores around the island. A full service bank makes getting cash easy. The bank is located near the ferry terminal on the main street, Pedro Marquez. Nearby are two pizza restaurants (William's Pizza and Heather's Pizza), bakery, and a few restaurants. There is also a gift shop nearby if you are looking for souvenirs. If you are camping and have time, it may be a good idea to stop by one of the grocery stores in town before paying $3 to make your way to the campground at Flamenco beach. Publicos are very easy to catch at the ferry terminal and you will not miss out on transportation if you do not get on one right away. Near the ferry terminal is the Information Center that is maintained by the Puerto Rico Tourism Company. There is also a U.S. post office just north on the opposite side of Pedro Marquez street. Pedro Marquez Street, Dewey, Puerto Rico. The small fruit and vegetable stand across from the post office is a good place to get some fruit. The variety changes almost daily, so be sure to check back often. Quality is different depending on the day and season of the produce that is being sold. With that being said, there is a good variety of items at the produce stand, a variety that the grocery stores of the island do not come close to meeting. If you are a vegetarian or vegan or just trying to eat healthy while on the island, you will want to stop at the produce stand and pick up some fruits and vegetables for your camping trip. The town of Dewey is pretty quiet overall, but more-so on the weekends, especially Sunday and on holidays. Many grocery stores and other stores are not open on Sundays and many do not open in the morning hours. Keep that in mind if you are paying for a publico to take you into the town. There are a couple of small "park" areas in Dewey. One is located on Ensenada Honda, which is the body of water to the north of town. The other is located near the south part, by the ferry terminal. These park areas are small, with a couple of picnic tables, but are both a nice place to relax if you are in town for a while. The small town of Dewey, Puerto Rico. If you want to rent a Jeep or another vehicle on Dewey, head towards the airport to Carlos Jeep Rental. A vehicle is not necessary to enjoy the island, but it makes getting around a lot easier. With that being said, many people do not rent a vehicle while on the island and still enjoy seeing the sites that are easily accessible by foot or by publico. Many of the area beaches can be reached by publico for a small fee ($2-$3 from the ferry terminal or other points in town). A good way to familiarize yourself with the town is to just explore the area. The town is perfectly safe any time of day. It is much more laid back than many other areas that you may have visited so far on your trip. With that in mind, it is not a very large town, but you will find that rarely is everything in town open, so you may find that there are some surprises in store each time you visit. Nice post!!! Thanks for sharing this.